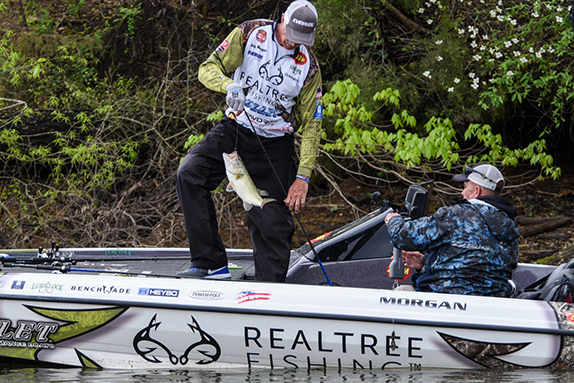 Andy Morgan led wire to wire today at Lake Chickamauga to claim his first top-tier win since 2007. For the past five days, Andy Morgan played the role of gracious host. The Dayton, Tenn., native let the Bass Pro Tour field pick apart his home waters at Lake Chickamauga to the tune of nearly 3,600 fish for more than 6,900 pounds through the first three rounds of competition. Today, it was Morgan�s turn to have some fun and he took a stroll down memory lane in the process. The 47-year-old was dominant from start to finish, totaling 26-10 in the weather-shortened first period before capping the day with 31-10 in the third period to eliminate all doubt who was the boss this week on the Tennessee River impoundment that many believe is currently the premier bass fishery in America. Fishing in an area he calls Bus Slough because there used to be an old school bus parked on a point that a man used to camp in from time to time, Morgan tallied 34 bass for an even 80 pounds, the second-most weight caught in a single BPT round this season. 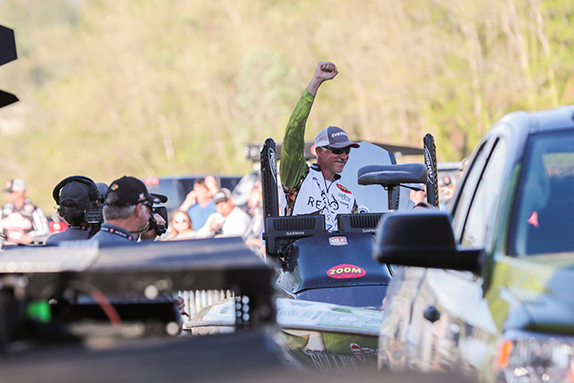 He then squeezed all the drama out of what was shaping up to be a thrilling two-man duel with Jared Lintner early in the third period and breezed to his first top-tier victory since an FLW Tour win at Beaver Lake in 2007. And every time, he took the grin-and-bear-it approach, smiling wide and flashing his awe-shucks east Tennessee charm. Inside, though, it burned him up. To finally capture one at home and in an area of the lake that he�s well-acquainted with made it all the more special. �You could not write a better script,� he said. After missing the money cut at the Kissimmee Chain in the BPT opener, Morgan�s finishes have improved at each stop. Lintner made him earn it in the third period, though. The Californian pulled to within 13 ounces of Morgan at 1:50 p.m. That�s when the three-time FLW Tour Angler of the Year hit a five-fish, 20-12 flurry over the next hour that included a 4-04, a 6-09 and a 5-07. When it was over, Morgan�s lead had swelled to nearly 16 pounds and the only thing left to be settled was how the other nine anglers would finish. Lintner, making his third Championship Round appearance of the season, finished with 31 bass for 60-07. Todd Faircloth carded 27 bass for 59-05 and finished 3rd. Knockout Round winner Jacob Powroznik was victimized by the bad weather early on as it negated his ability to target shallow fish with a wacky-rigged worm. With brighter skies in the third, he made a furious charge up the leaderboard, catching 44-10 to finish 4th with 54-04 (21 fish). Mike Iaconelli was the other angler to crack the 50-pound mark, finishing 5th with 54-02 (25 fish). The only dramatic element of today�s competition was the weather. Upon reviewing the forecast this morning, MLF officials allowed anglers to trailer their boats to a ramp of their preference rather than all 10 competitors leave from Dayton Boat Dock. Morgan, Faircloth and Brandon Palaniuk were the only ones to leave from the host ramp. Action got started on schedule at 7:30 a.m., but was halted for an hour at around 8:15 due to lightning. The hour was then tacked on to the end of the third period. No other delays were needed, which spelled doom for Morgan�s competitors. Bus Slough is a sentimental place for Morgan as it�s where he and his dad, Mark, fished and duck hunted in Andy�s youth. It�s where he won his first tournament fishing by himself, in April no less. It�s where the Morgan boys won numerous local derbies in the spring and it�s where Andy pinned his chances today. �I wanted to win one more bass tournament here on Chickamauga and I wanted to do it in April,� Morgan said. A band of violent weather this morning didn�t deter him. In fact, he believes the conditions were critical to deterring others from heading to the lake altogether. Morgan swings one of his 34 bass into the boat today. Fishing-wise, it was Andy Morgan 101 as he dissected nearly every piece of shallow cover in the water. He employed a lipless crankbait, a vibrating jig and flipped a craw imitation to generate the majority of his bites. Without any other boats in the area, he was able to recycle a bunch of water. As for the afternoon flurry that put Lintner and Co. in his rearview mirror, he said it was a case of good timing. Still, he never got complacent or felt like he had the win clinched even after his last fish, a 2 1/2-pounder, got him to 80 pounds even. Lintner believes there was nothing more he could do today, short of stealing the prop off Morgan�s outboard. Jared Lintner got to within a pound of Morgan early in the third period, but never was able to overtake him. 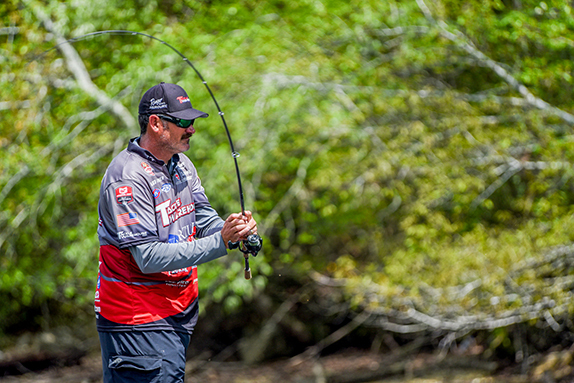 The runner-up finish moved Lintner up to third in Angler of the Year points and he shows no signs of slowing down. Faircloth figured the race for second was all he could fish for once the noon hour rolled around. After maximizing an area down the lake in the earlier rounds, he made a move up the river to some dirtier water where the fish were less pressured. Powroznik caught more weight in the third period than four other finalists caught all day. He wasn�t about to complain about the conditions early, but it surely played a role in him in catching only five fish for 9-10 through two periods. > Day 6 stats: First period � 62 fish, 127-14 pounds; Second period � 81 fish, 158-11 pounds; Third period � 92 fish, 208-10 pounds; Total � 235 fish, 495-03 pounds.